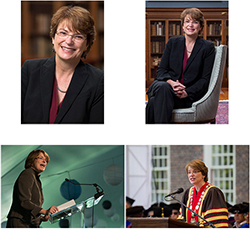 An advocate for the power of research and scholarship to address 21st –century challenges, Christina Paxson is nationally recognized as a respected economist and public health expert. Her research focuses increasingly on the relationship of economic factors to health and welfare over the life course. With 6,100 undergraduates, 2,200 graduate students and 400 medical students, Brown’s size allows a strong sense of community, and frequent engagement with faculty, staff and administrators with students. Being a partner in the economic growth of Providence and Rhode Island is a priority for Brown. The University’s vision is to contribute to the development of a vibrant ecosystem of academics, commerce and innovation, building on more than $200 million in investment in the Jewelry District. Brown has ambitious goals to reach new levels of academic excellence through integrative research and innovative education in service to the community, the nation and the world. Our plans are built on Brown’s core values: a commitment to academic excellence at the highest levels; a spirit of independence and creativity in education and scholarship; and a belief that academic excellence and innovation are best supported by a cohesive and diverse intellectual community. Office hours are subject to change. Please contact (401) 863-2234; or [email protected] with questions.